Charles Sanna has died at the age of 101, and if you’ve ever enjoyed the convenience of instant hot cocoa, you have him to thank. Sanna died on March 13 in hospice care in Madison, according to the Wisconsin State Journal (we were alerted of this news via The New York Times). Sanna helped formulate instant hot cocoa mix, which would later become Swiss Miss and go on to sell some 50 million boxes annually. Sanna earned a mechanical engineering degree, worked for U.S. Steel and fought in the Pacific Theater during World War II. But his biggest claim to fame came in the early 1960s, when during his off time in the evening, Sanna tested out a recipe for instant hot chocolate—with his five children as taste-testers. Sanna’s formula for making “instantly soluble nonfat dry milk” was awarded a patent in 1963, and joined the Wisconsin dairy company his father founded—Sanna Dairy Engineers—the following year. According to the State Journal, the product was originally called Brown Miss and sold primarily to airports and restaurants. When the Sannas decided to shift to the retail market, they removed the butter fats from the recipe, which made the cocoa mix more shelf-stable. Sanna Dairy Engineers was bought out in 1967, which was then absorbed into ConAgra in 1990. 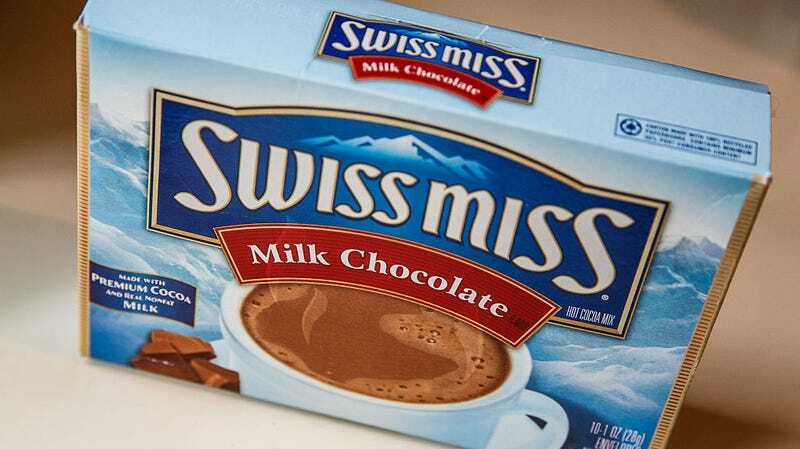 How many packets of Swiss Miss did I go through during Boy Scout camping days? How many midnight mugs of instant hot cocoa did I gussy up with evaporated milk? That number is more than I can count. And when it’s that high—and I’m certainly not the only one—you know you’ve done the world some good. Just in February, he told his hometown State Journal: “It nice to know that you’ve done something that will carry on.” Rest easy, Charles Sanna.